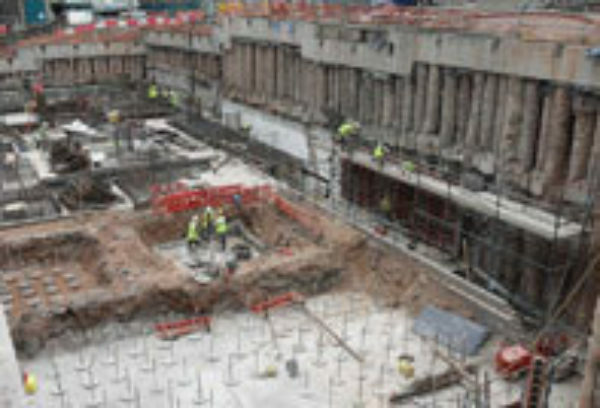 This major scheme consisted of a secant piled wall to form a 13 metre deep excavation followed by anti-flotation bearing piles. Two CFA piling rigs completed 537 linear metres of 900 diameter and 750 diameter secant wall. These high torque rigs drilled almost 13km of hard Dublin boulder clay to form the retaining wall for a 3-storey basement. Before excavation of the basement, the wall was pinned back using approx 160no ground anchors. The retained height is some 14 metres. A second phase of work involved the completion of a further 100 metres of secant wall. A new related contract followed under the title of ‘Heuston Square’ when FKL returned to site to install approx 1500no anti-flotation tension piles. These piles were installed within the 14 metre deep basement over a period of 2 years in a number of phases.